Although their first couple of songs were marred by oppressively poor sound — all highs and lows, no warmth, a wall of undifferentiated instrument and vocal — once they got the mix right, the small audience was able to settle in for a loose, memorable set from the New York-based crew. 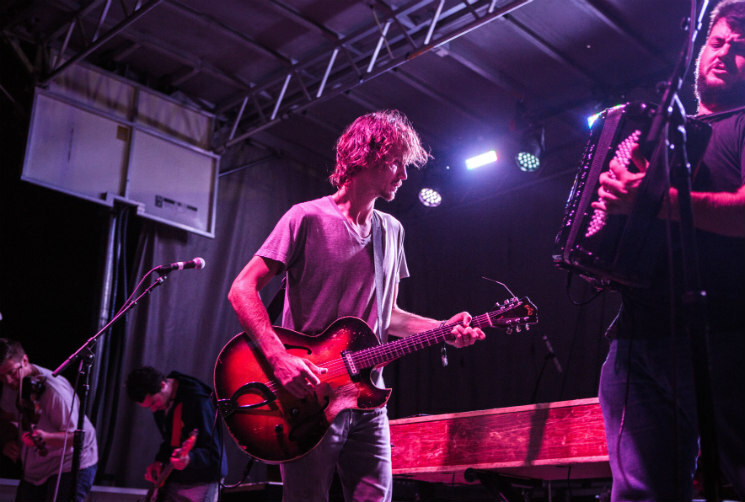 Playing music reminiscent of Basement Tapes-era Dylan and the Band, the Felice Brothers' unpretentious and blissfully homespun stage show stood out amid the rush of more polished acts. Though they have certainly explored more tightly arranged and produced music over their decade-plus career, they seem to have found their lane with the ramshackle Appalachian sound we saw last night (September 17). Rough and ragged, but with serious musicianship underneath the shamble, the band treated the show like it was some kind of kitchen party. Raucous and loose, familial, and comfortable with discordant notes and missed harmonies, it's not for everyone, but what is? For my money, this shaggy dog approach feels pretty vital in this era of disco-folk and Mumfordized Americana.